The Account Owner is the person who registers for the account which is not always the person who owns business. If you would like to transfer the owner account info to someone else, please give us a call. We will need to verify the request in order to make this change. The account owner should register with information that belongs only to them. They should register with an email account that no one else has access to. This will prevent the possibility that someone else may try to attempt to reset your password without your authorization. Use a personal email like John.Smith@happymovers.com or John.Smith@gmail.com Don’t use a shared Company Email like info@happymovers.com or happymovers@gmail.com The “main email” for company or the email you use for many purposes for the business that multiple people have access to should not be used as the account owner email address. Read the Tool Tip when assigning each staff member to a role, this tells you what that individual will be able to see and do within MB According to the user role you select for them. Please Note: Some of your users have the ability to create additional user accounts. Staff Directory Make sure your contacts within staff are accurate and current. Duplicate, unidentifiable or unused accounts should be either disabled or deleted. To do so, select the user, click edit and choose disable or delete. *your ability to delete a staff member will depend on whether or not there is already job data associated with that user. Disabling a user will deny them access. Within the SetUp tab, you can further customize what users in a particular group can do and see. 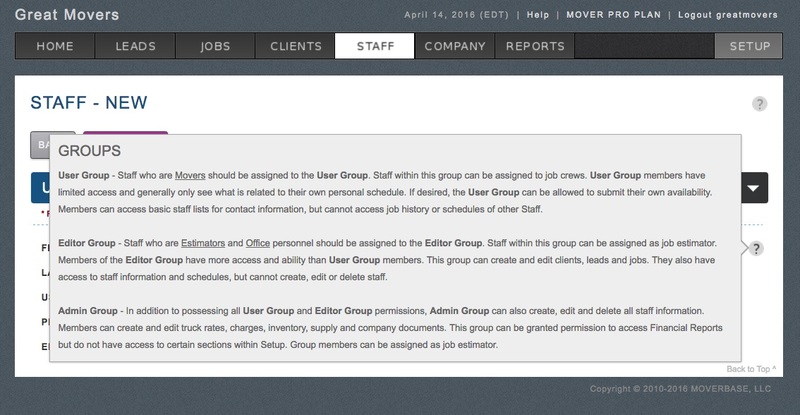 Be aware that changes made will be true for the entire user group and any future staff you will add to that user group. You can come back to this page at any time to view or change your settings. Refer to the Log to see a simplified record of who is doing what. Basic information can be found here, if anything looks suspicious, make sure to note which user is doing the action. If you see the username and you are not sure who the individual person that the user name refers to, you can search it in the staff tab and find out. If needed, you can edit the staff member’s info and settings. If possible, avoid having accounts that multiple people log into and use- this will make tracking the log more difficult. Whether you are using computers, mobile phones, tablets or all of the above, do so in a way that is smart. Staff members should adhere to whatever security measures are put in place by the employer. Employers can view the tips below to consider what procedures they should have in place.